Which Uber is best for me? How much is Uber right now? Estimate your Uber Ride. Avoid surge pricing. Click to dispatch. UberFareFinder calculates the cost of your Uber ride. Enter your pickup and dropoff locations, and get the fare estimate and surge pricing information for Uber’s primary services (UberX, Uber Black, Uber XL, etc.) available in your area. Check your surge pricing! UberFareFinder even warns you of surge pricing currently enacted in your location. Already use Uber? You can request Uber directly from UberFareFinder..just click. Uber is an on-demand car service that allows users to request a ride through their Android or iPhone app. Once a driver is signaled through the app, it usually takes less than 10 minutes for a car to arrive at your door. During this brief wait period, Uber allows you to track the cars location so you know exactly when to expect its arrival. The app provides a cashless payment process by charging all Uber rides to an on file credit card attached to your account. One thing to note though, sometimes Uber enacts surge pricing during peak travel times, meaning your fare could double, triple, or even cost you up to 7X the normal amount! On the plus side, when surge pricing is in effect you will be notified within the app before you request a ride. Uber is currently available in 67 countries! 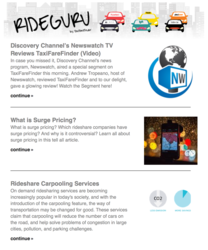 What rideshare services does Uber offer? Uber’s budget option in Europe, and nearly identical to their Uber X option within the United States. When you select an Uber POP car, an everyday car with seating for up to 4 people will arrive to pick you up. The Uber X for SUV’s. While a typical UberX car can only seat up to 4 people, an Uber XL will have seating for up to 6 people. Note that this is not the SUV "luxury version," cars are not required to be black or high-end. Uber’s original luxury service. When you select an Uber Black car, a high-end sedan with seating for up to 4 people will arrive to pick you up. While you will ride in style, the price for an Uber Black car is significantly higher than an Uber X. Unlike cheaper Uber services, Uber Black drivers must also have city-specific airport permits (when required) and commercial registration and insurance. Luxury SUV option. This is one of Uber’s more expensive (in most cities, most expensive) option. When you select Uber SUV, a high end SUV with seating for up to 6 people will arrive to pick you up. Unlike cheaper Uber services, Uber SUV drivers must insurance. This is your typical taxi. Uber has an agreement with some taxi cab companies allowing you to book a typical taxi but pay through the Uber app. This is Uber’s corporate service for those who want a chic yet understated alternative to Uber LUX. Uber EXEC is typically a mid-tier car with seating for up to 4 people. This service is only currently only available in the UK and Singapore. UberWAV is Uber’s wheelchair accessible vehicle service which allows riders with relevant disabilities to request wheelchair accessible vehicles. When an UberWAV is ordered, a vehicle equipped with a ramp or a lift will pick you and your party up. Pricing for UberWAV is typically similar to the prices of an Uber XL car. Uber’s UberSelect service is very similar to Uber Black except with UberSelect the car does not have to be black. It’s a step above UberX, yet slightly below the prices of UberBlack. When you request an UberSelect a higher end sedan with seating for up to 4 people will pick you up. One fun requirement is that the vehicle must have leather seats! UberEspañol is the same service as UberX except the driver is guaranteed to speak Spanish for the customers benefit. When you select an UberEspañol car, an everyday car with seating for up to 4 people will arrive to pick you up. Uber’s UberAssist service is designed to provide additional assistance and support to seniors and people with disabilities. UberAssist Drivers are specifically trained by Open Doors Organization to assist riders into vehicles that can accommodate folding wheelchairs, walkers, and scooters. UberASSIST pricing is the same as UberX. UberPlus is a step above UberX, yet slightly below the prices of UberBlack. When you order an UberPlus you can expect a midrange car with seating for up to 4 people to pick you up. UberEnglish is the same service as UberX except the driver is guaranteed to speak English for the customers benefit. When you select an UberEnglish car, an everyday car with seating for up to 4 people will arrive to pick you up. UberGo is Uber’s cheapest option in India. UberGo is even cheaper than the more well-known UberX or UberPOP. When you order an UberGO, a chauffeur-driven hatchback like an Etios Liva or Maruti Ritz will arrive to pick you up. Uber claims their UberGo service is even cheaper than a traditional auto-rickshaw. Uber Pedal allows you to request an UberX car that is equipped with a Saris bike rack (fits up to two bicycles), so you can easily go from 2 wheels to 4! Pricing for Uber Pedal is the same as UberX with a $5 surcharge added on for the convenience of the bicycle rack. UberWine is a specialty service of Uber’s that connects riders who would like to do a wine tour in the Santa Barbara and San Luis Obispo regions with drivers who are knowledgeable about the wine country. There is no time or distance limit with UberWine, you get to pick how long you would like your driver for and which vineyards you would like to visit. When you choose UberWine a standard car with seating for up to 6 people will arrive to pick you up. UberWine XL is a specialty service of Uber’s that connects riders who would like to do a wine tour in the Santa Barbara and San Luis Obispo regions with drivers who are knowledgeable about the wine country. There is no time or distance limit with UberWine, you get to pick how long you would like your driver for and which vineyards you would like to visit. When you choose UberWine a SUV car with seating for up to 6 people will arrive to pick you up. Uber WIFI gives you free Wifi access on your ride. When you use Uber Wifi, a high-end car will pick you up with room for up to four people. UberFareFinder is not affiliated with Uber®. If you have any questions, please contact us.